I remember the first time I went to Epcot as a child. I thought the world showcase was the coolest thing ever. I felt like I was really visiting those countries as I walked and ate my way through them. Even though I have actually been to many of the countries in person now, I still love the world showcase! I plan as many dinners there as I can when I travel to Disney World. The four teenagers walked around England while the three adults had a few drinks in the pub and waited for dinner. 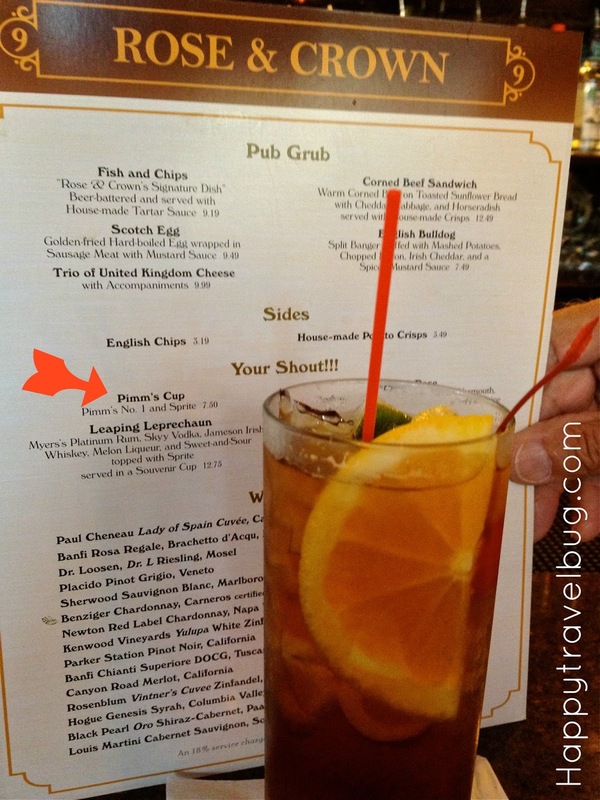 I discovered Pimm’s when I was on a trip to England (the real England!) and loved it. So I started with that. As usual, I wanted to try something new. I spotted this scotch egg on the appetizer list and thought that sounded good. It was a boiled egg wrapped in sausage and served with mustard. It was good! I would love to recreate it for breakfast or brunch. I liked the little salad that came with it, but the toast sticks were pretty plain. The other new thing I decided to try was called bubble & squeak. I was not a fan! It is mashed potatoes with cabbage and onions, all covered in gravy. Even though I like all those things, I didn’t like them all together. Oh well, that happens sometimes when you try new things. But now I know what it is and that I don’t like it. Good to know! Of course, someone had to get fish and chips! My daughter and nieces all got it and loved every bite! My son LOVES cottage pie and couldn’t wait to dig in. He gets so annoyed that I have to take pictures first. 🙂 Underneath all that yummy mashed potato was ground beef, onions, carrots, mushrooms and cheddar cheese. Watch that video I mentioned above to see the inside. My father-in-law got the same thing. Funny how that works. My mother-in-law and I split this chicory and watercress salad. It had apples, candied walnuts, craisins and blue cheese. I love all those flavors in a salad…sweet and savory…and the lettuce choice was new and tasty as well. She also had the roasted sea scallops off the appetizer menu for her meal. They were served with spinach pesto, tomato and olive vinaigrette. Very delicious! We decided to all share the no sugar added yogurt parfait for dessert. I liked the Earl Grey Granola on the top the best. If I hadn’t been so full I would have ordered the sticky toffee pudding. I’ll just have to save that for the next time. We ran into Winnie the Pooh and Tigger too while we were walking around England. Epcot is the park to go to for short character lines. I miss the days when the kids wanted to meet and hug them. But there are a lot of new and exciting things that teenagers bring, so I’ll just enjoy each age as it comes. 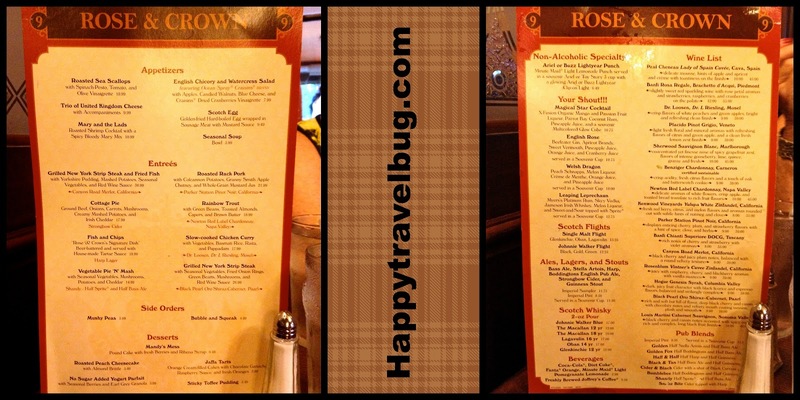 This was my first time eating at the Rose & Crown. I enjoyed it, but I like other Epcot restaurants better. I probably wouldn’t book reservations here again unless I was traveling with someone who wanted to. Ever been to Epcot? 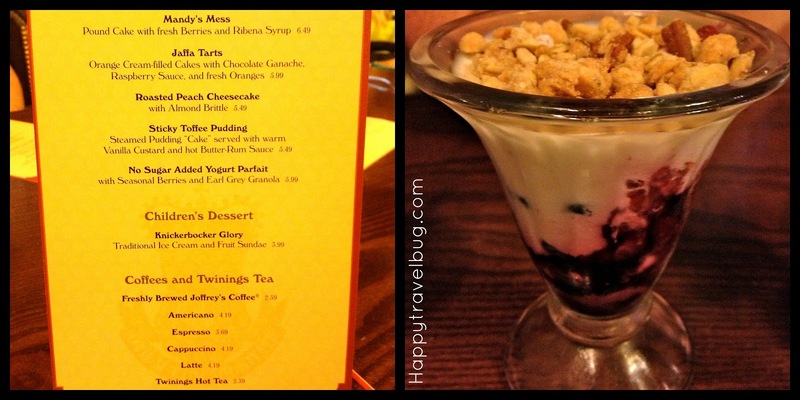 What is your favorite Epcot restaurant? Check out what others are eating at Peasandcrayons.com, FoodieTuesday & WanderFood Wednesday. Wow! I am impressed. I haven't been to Epcot, but it doesn't look like Disneyland can compare (except Napa Rose). That looks like a lovely British dinner! Epcot has awesome places to eat, shop and just wander around. It is my favorite Disney Park! I think it's neat that although you've been to the actual countries that you still enjoy Epcot. I host a weekly link party called "Oh, the PLACES I've been!" and would love to have you link. We love eating at Epcot for the diverse and ethnic foods. Epcot has more to offer for the boomer age group than other Disney places and this is our favorite place to go too. So neat to 'visit' a different country without needing a passport. Your father-in-law sounds like a fun traveling partner. That cottage pie sounds a bit like shepherd's pie. I loved it and made it over and over months after I returned from my first trip to England. I still haven't tried to make fish and chips though. Yes, I thought is was like shepherd's pie as well. My son LOVES that!